Rod storage tube protects welding rods from dirt, moisture and heat. Protects rods from heat up to 225 degrees Fahrenheit. Storage tubes will hold up to 10 lbs. of 10 to 14" long electrodes. Rod storage container is made of high impact polyethylene plastic. KIT 137 Gal. Green/Charcoal Galvanized Steel Animal Resistant Storage Container The SECURE STORAGE SOLUTION Series Storage Container/Trash Receptacle is easily strong enough to keep out the smaller critters like raccoons, squirrels and rats and will give great results with smaller Black Bears. To meet the requirements of being a Certified Bear Resistant bin you will need to install the included Bear Guard brackets, which prevent bears from being able to grab the lids and potentially bend them. With these brackets the GRIZZLY is able to stand up to all Black and mid-sized (up to 600 lbs.) Grizzly Bears. KIT 137 Gal. 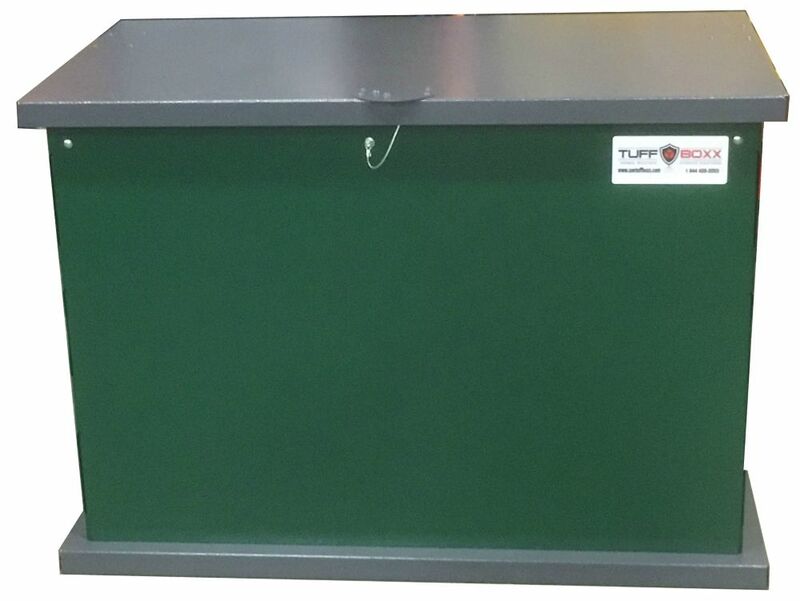 Green/Charcoal Galvanized Steel Animal Resistant Storage Container is rated 5.0 out of 5 by 2. Rated 5 out of 5 by Shelagh from Very well constructed and considering its construction relatively easy to... Very well constructed and considering its construction relatively easy to put together. I had no idea it had gas shocks to hold the lid up - an added and appreciated bonus! It should be advertised as more than just a trash container - I am using it for outside animal feed storage. Love it! Rated 5 out of 5 by Caveman from Home Depot assembled the product for me and I really appreciated that. The Tuff Boxx people were ... Home Depot assembled the product for me and I really appreciated that. The Tuff Boxx people were great. Very informative and a lot of help.They sent me the bear brackets directly with assembly plans. I haven't been up to my cabin to install them yet but hope to in a couple of weeks.